(Message deleted by the author). The White Devil doesn't run Away from a fight! *kofs* Though I think we should just get over it. She has to face Teana at one point. Agreed. I saw this coming from the begining. ._. So,... everything from the beginning or just load that safe file? Reload from the last save point! B! Reload last save point dammit, I will not stand by and let this happen. BUT WHY DID YOU GUYS SEND HER TO THE ROOF!? You could've seen that coming >_> well.. not the kissingscene, but the revenge-raep-attack by Teana-kaichou..
now we go RELOAD!! and then B!! it is.. The game looks really promising as well!! Can't wait till it's updated.. I can't draw that well yet, so I can't help either.. I'm only fairly good with editing pics I guess.. :\ Good luck anyways!! Because the roof is a trap! Window? Aren't they on the 3rd floor? Well, whatever. I'ma have to go with A. I Agree with Shari-chan, that window just seems to easy. 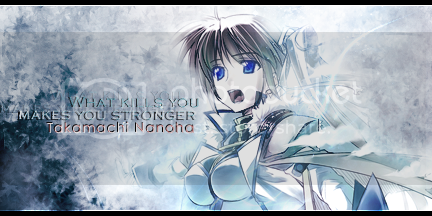 If she jumps out the window she'll break her leg or something >_> There could be something to help Nanoha on the roof. You never know. I have a gut feelin' Teana will be waiting for her up there on the roof.